DAMASCUS – Voting began across government-controlled parts of Syria on Sunday for the war-ravaged country's first local elections since 2011, state news agency SANA said. Polling booths opened at 7:00 am (0400 GMT) and are expected to stay open for 12 hours. "Voting centres opened for citizens to cast their ballots to elect their representatives in the local administrative councils," SANA reported. "More than 40,000 candidates are competing for 18,478 seats across all provinces," it said. 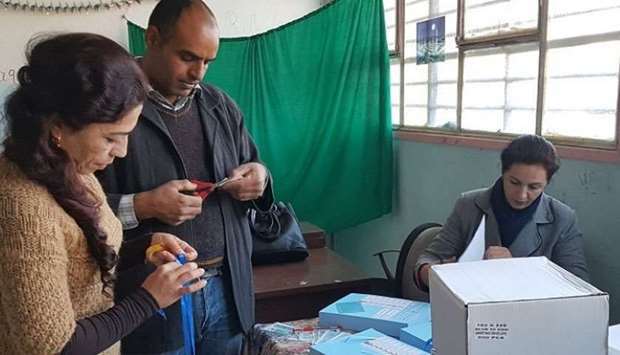 Syrian state television broadcast footage of voters around Damascus and in the coastal government bastions of Tartus and Latakia dropping their ballots into plastic boxes as election officials looked on. Voting was expected in some of the recaptured areas. The number of seats had slightly increased from the roughly 17,000 open in the last elections, as smaller villages had been promoted to fully fledged municipalities. The councils operate at the municipal level, and newly elected representatives are expected to have more responsibilities than their predecessors, especially those linked to reconstruction and urban development. Syria last held local elections in December 2011, just nine months into the conflict.